After a long period of being married, Jonathon Lott has landed on the perilous rocky shore of marital separation. He’s wealthy, good-looking, only 55, still able to attract the attention of hopefuls within and outside his age bracket. But it’s not what he wants. He doesn’t want to start again, he wants the ease of a comfortable old marriage. Perhaps this contributed to Sarah’s departure… readers will make up their own minds about that. That very ambiguity is what lifts the novel out of the predictable romance genre. It goes nowhere near Relationships #101 because the author brings original insights to bear on the story. It’s narrated from several points of view besides Jonathan’s, ranging across the generations with Penny Collins in the middle, sandwiched between the demands of her difficult old mother Marie and her impulsive daughter Scarlet. ‘One can never live too far away from one’s mother’ says Penny’s sister Rosemary in Perth. Yes, the most isolated city in the world, and well away from a mother who is asked to leave one retirement home after another. Penny has been landed with her mother and while love can be comfortably pragmatic from Rosemary’s distance of 4000km away, close up, it’s not so easy. Especially with a mother as awful as Marie has consistently been, belittling Penny since childhood, upstaging her at every turn, mocking her ambition to be an artist and not the teacher that she has had to settle for. (See this Sensational Snippet from the novel). That’s the trouble with parents, Johnson knows. They can be difficult indeed, not people that you like, but the urge to protect them and care for them when they are vulnerable goes far beyond a sense of irritated duty. In Penny’s case, she knows too little about her mother’s own painful childhood, too little about the fragility of her self-confidence. What might have helped her understand her mother’s defensive strategies remains hidden except for unguarded moments that leak snippets of her life story to her baffled daughter. And this ambiguity is true too. Sometimes it’s just not possible for children to know their parents, and more so when the child is like Penny, a first generation Australian who grew up believing in the idea of home as a safe haven, a concept still foreign to many people around the world. The setting, for all its upmarket lakeside location, is a mirror reflecting the realities of life in small communities everywhere. Everyone knows everyone, and knows everyone’s business. There is no need for internet shaming, embarrassment lies around every corner. Yet the homing instinct brings people back to where they belong, even when holding one’s head up high is harder to do in a place where there is nowhere to hide. One minor character also exposes how cruel and distant small communities can be, how they can exclude the outsider who doesn’t fit their norms. Giselle, only seven, has come to The Landing because one of her mother’s friends has offered them a temporary home after the boyfriend committed suicide. But her nameless mother is a negligent drug addict, and while Jonathan takes a fleeting interest, Sylv who runs the only shop in the community dismisses Giselle without a thought. ‘Poor child’ says Jonathan when Giselle leaves the shop, her wish for a Wagon Wheel ungranted. 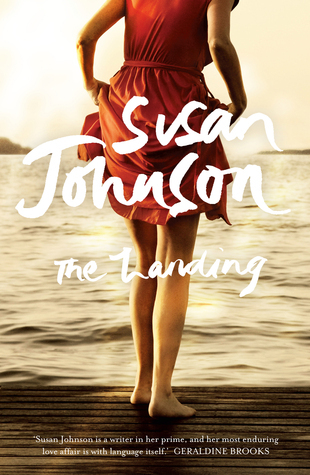 The Landing is a wise and thoughtful commentary on Australian contemporary life, from one of our best authors. I reviewed The Landing for the Age and Sydney Morning Herald. It’s interesting that you picked such different aspects of the book to comment on – can’t say what mine were because my review hasn’t been published yet. I always like hearing what other reviewers have to say. Bother, we don’t get The Age any more! Hopefully they will publish it online too? I enjoyed the novel. I think it is witty and thoughtful, and think both reviews were excellent. I know my book club would have fun in dissecting the characters. I thought the ending for all the characters was far too neat. Like you Lisa, I did worry about Giselle. I don’t think her life would turn out well. Yes, a haunting little character, Giselle… it’s not a neat ending for her, that’s for sure! But I wonder about the others…if I imagine myself writing the next couple of chapters, are those pairings going to work out? I’m not so sure!